Your brick repair needs. Our expertise. ​Hello and welcome! 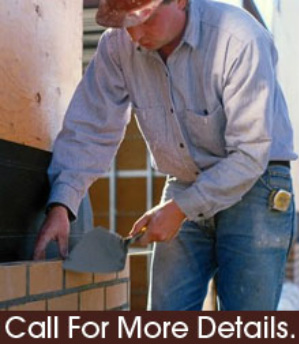 Modern Masonry Repair Company is centrally located in Little Elm, TX and specializes exclusively in brick repair and restoration, including chimneys and mailboxes, in North Texas. While most stonework and brick masonry companies in Dallas and DFW offer everything from foundation repair to patio construction, we believe in focusing on doing one thing and doing it well. Our focus on brick repair allows us to pass savings on to you by keeping overhead and other costs as low as possible while still providing you with the most skilled masonry services in the Dallas, TX area. Call us locally at (469) 879-2515 for a quote! Leaning walls: Sagging brick walls are a common issue for DFW homeowners. Whether it's a tree root or shifting under the walls foundation, this can be a safety hazard and cause problems.. We can stabilize these walls to prevent them from continuing to lean or from collapse. Chimney leaks: After a rainy day, you may notice water leaks inside your fireplace. Chimney leaks can be caused by a few cracks or holes in the mortar crown, to something as basic as re-sealing around the flashing. Most homes have issues with moisture entering the chimney or mortar cap. Birds nesting in the area can also cause issues and leaks. If these issues sound familiar, we are here to help. All active chimney's should be checked annually before use for damage or debris. In most cases hireing a masonry company to repair your chimney won't get the job done. Here is why, they more offten than not will only repair the visibly damaged brick, or mortar. That does nothing for preventing water from getting in. We generally replace mortar from top to bottom insuring that all the mortar joints and cracks are repaired watertight! Water leaks around chimney's are the primar reason for Chimney repair. Brick mailboxes: You'd be surprised at how often brick mailboxes need a little TLC here in DFW. No job is too big or small. Brick mailboxes are a beautiful addition to any home. Mailboxes add an extra sophisticated flare to the curb appeal of your home! Masonry walls are relatively permanent and can be extremely attractive looking, particularly if the bricks or blocks are set in an open, decorative checkerboard pattern so that light, breeze and some sense of space can come through. When it comes to fences, the patterns and materials are mostly unlimited. No matter what your needs are, we can help! Goode Gutters can help with gutter services and has used us in the past. 360 Innovations Metal Roofing handles high-end custom copper roofing. We've been on many roofs with them. J&J Firewood had their furnace break down a while back and we helped repair it. Get full scale paving from Advanced Paving. We've known the owner for years now and they do great work. Serving the Little Elm area including - Denton, Carrollton, Richardson, Frisco, Plano, Irving, Lewisville, Grand Prairie, Coppell, McKinney, Highland Village, Hickory Creek, Lake Dallas and more.